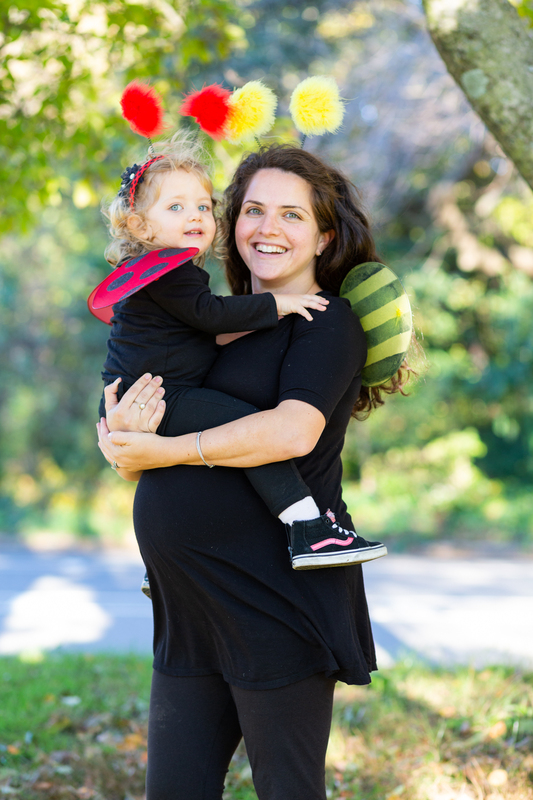 Over Halloween, I was 40 weeks pregnant (plus 3 days!) and Adina had just turned two years old a few days earlier. But my big belly wasn’t going to stop us from dressing up and if you know me, you know I couldn’t resist matching with my mini! I had to come up with costumes that would be easy for both of us and comfortable for me at the very end of my third trimester. We kept it pretty simple and went with all black outfits and fun “bug” accessories and dressed up as a lady bug and a bumble bee. I wore a flow-y black top with leggings and Adina wore black pants and a long-sleeved black shirt. I lived in leggings throughout my pregnancy so this costume was perfect for me! My mom actually picked up these cute accessories from Walmart. Each set came with a headband, a choker necklace, arm bands and wings. 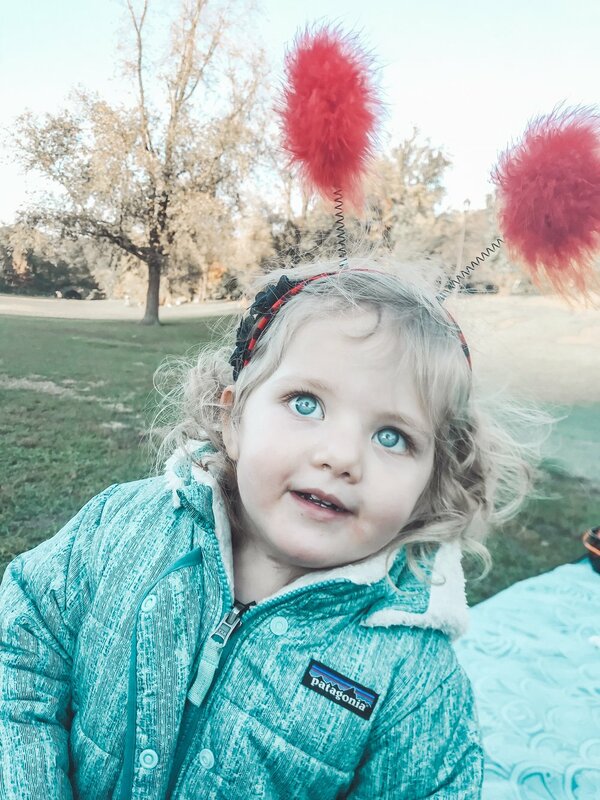 I thought Adina might not want to keep the wings on or the ladybug headband on her head, but she totally surprised me and didn’t want to take them off! We managed to get good use out of these simply costumes! We got to dress up a couple of times before the actual day of Halloween. Michael’s office had a Halloween party for families and we celebrated one of Adina’s friend’s second birthday with a costume party in the park. 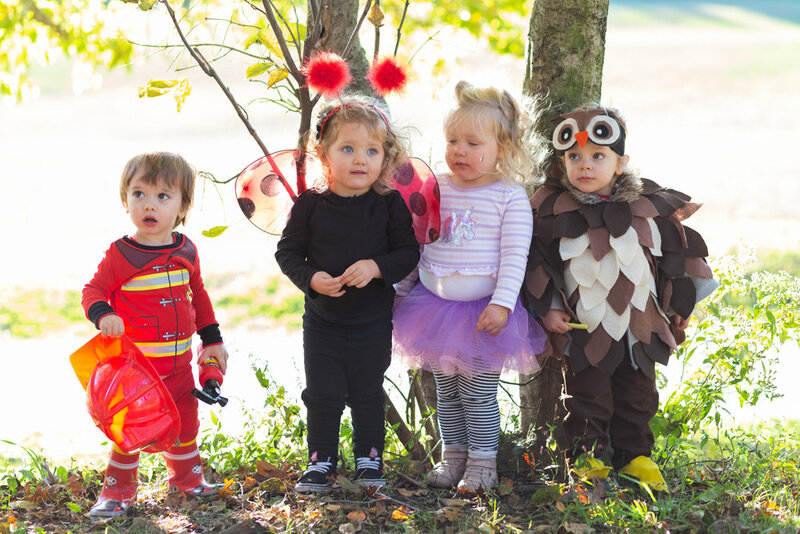 The weather was so nice that day and Adina and her friends had so much fun dressing up! We wore our costumes a third time to go trick-or-treating. Adina could have cared less about getting candy. She was mesmerized by all of the bigger kids in costumes and the amazing decorations in our neighborhood. For all of October and a few weeks into November, she pointed out every single pumpkin, skeleton, and spider decoration she saw! Adina was barely one year old last year when we dressed up as unicorns. This year she was so much more aware of everything going on and had such a fun time dressing up with me and taking in everything about the holiday. Can’t wait for more matching costumes to come! Images taken in the park by Karen Wise Photography.